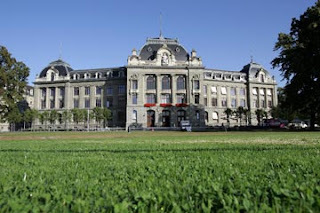 The University of Bern (German: Universität Bern, French: Université de Berne) is a university in the Swiss capital of Berne. It was founded in 1834. 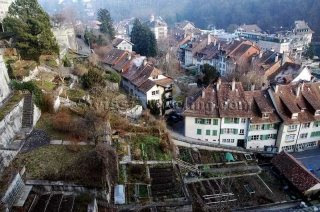 The university is regulated and financed by the Canton of Berne. The university’s comprehensive offering includes 8 faculties and some 160 institutes that date back to the XVIth century. With 13,000 students, it is of mid-range size among Swiss universities. Unlike the bigger institutions, it retains a human dimension and a warm and friendly atmosphere. became necessary to assure the training of protestant ministers after the Reformation. The original number of three professors was doubled by the end of the 17th century. During the 18th century education in the humanities and divinity stayed in the foreground. With the onset of the Age of Enlightenment Chairs of Law and of Mathematics were added. In 1805 the Bern government reorganised the entire tertiary education system by expanding the School of Theology into an Academy with four faculties. Thus not only ministers but also lawyers and physicians (including veterinarians) could complete their entire education in Bern. 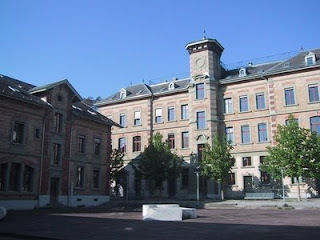 The Philosophical Faculty (Humanities and Natural Sciences) was to lay the foundation for the three «higher» faculties. University following the German model. The University Law passed in 1834 introduced academic freedom for study and instruction. The number of professors increased from 29 to 45. In the beginning entry requirements were very low in order to enable the rural population to gain access to higher education. The University of Bern was soon drawn into the great political altercations of the time. Only in the second half of the century did circumstances allow for a more serene development. century, the Institute of Natural Sciences left the old Monastery to move into its own building, and in 1903, the new Main Building of the University on the «Grosse Schanze» could be inaugurated. 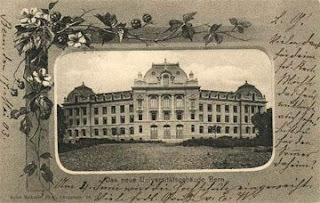 After the turn of the century, the number of faculties and departments increased. The Veterinary School had separated from the University in 1868 and reunited with it in 1900 as a separate faculty. As a reaction to the papal dogma of infallibility a national catholic church, independent from Rome, was founded. Unique in Switzerland, the University of Bern established a Faculty of Independent Catholic Theology («Christkatholische Theologische Fakultät») to support this development. In the course of the 19th century the two directions within the Faculty of Philosophy moved more and more apart, and in 1921 the formal separation between the Faculties of Philosophical History on the one hand and of Natural Sciences on the other took place. With the growing prominence of Economic Sciences, a separate department was established in 1912 within the Faculty of Law, which in 1954 was renamed Faculty of Law and Economics. Up to the end of the Second World War, the University went through a period of quiet expansion. Its position in the economic and cultural life was widely appreciated. In the fifties and sixties of the last century demands were raised for the «development of the formative potential» and «enlargement of the academic and technical sector of education». While there were still only 250 professors (very few among them women) and 2122 students in 1956, a phase of rapid growth now began. The University also increased in space. The Humanities moved into locations outside the Main Building in order to meet their need for more room. But the rapid expansion soon led to new problems and requirements. Federal educational policies became more and more influential, and in order to better control the ever increasing complexity of the University, a revision of the University Law (modified previously in 1954) seemed vital. But a restructuring plan proposed by governmentcommissioned experts in 1969 was never realized, nor was a corresponding draft law that had been submitted by the University Administration. An attempt to ratify a partial revision via referendum failed in 1982 and in 1989, when Bern counted 9000 students and 1200 professors (and still hardly any women among them), a minimally revised law was passed. Finally, with the new law of September 1st, 1997 the University became its own legal entity with explicit remits set by the cantonal government. The Philosophical-Historical Faculty is similar to the Arts & Sciences departments at American universities, with majors (Hauptfächer) in a variety of languages, history, linguistics, economics, philosophy, psychology, etc. The Philosophical-Scientific Faculty is restricted to the "hard" sciences, like chemistry or physics. The philosophic-Humanistic Faculty was founded 2005 and allows studies in Education, Sports and psychological studies. The department of Old Catholic Theology at the Faculty of Theology is the only place in the world to study theology in this kind of denomination. The Faculty of Theology has the lowest number of students, while the Philosophical-Historical Faculty has the most students.